Have you installed SQL Server 2008 Data Mining Add-Ins for Microsoft Office and it doesn't functioning neither showing up in your Office's ribbon toolbar ? Even when you notice that it has been installed and visible in Excel's Add-Ins list ? I once had the same problem and got the solution thanks to Bogdan Crivot from this post. 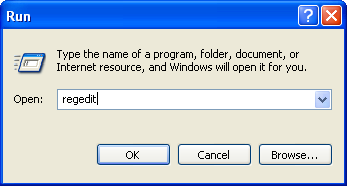 Type "regedit" and click "OK"
"HKEY_LOCAL_MACHINE\SOFTWARE\Microsoft\Office\Excel\Addins\SQLServer.DMClientXLAddIn" 's LoadBehavior to "3"
Start your MS Office Excel 2007 Application and notice that Data Mining tab in Ribbon toolbar is now showed up. Note: This add-in requires connection to SQL Server Analysis Service as its data mining engine.